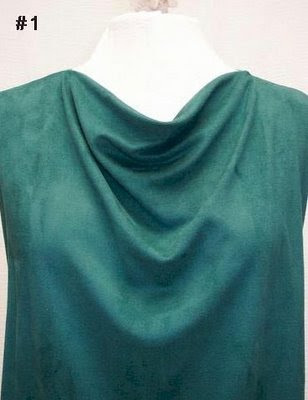 This is a quick stylish variation on a drape-front (true Cowl) silhouette that can be done in just minutes! First, start with a drape-front cowl (photo #1) already in your wardrobe, or make one with the many patterns that exist for this style. 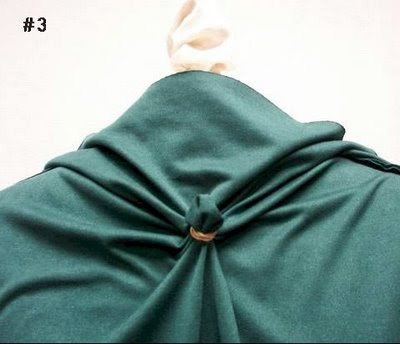 As shown In photo #2, turn the garment inside out and flip the facing up to expose the wrong side of front of the top. Next, pinch some fabric near center front, twist it a bit, and hold the “pinched” fabric with a rubber band, as shown in photo #3. Later, if you want to make this design change permanent, the 'twist' can be stitched. 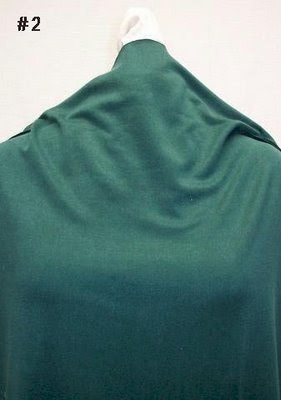 Or just remove the band, and you have your original draped cowl! Note: A small clear "ponytail" band works well for this! 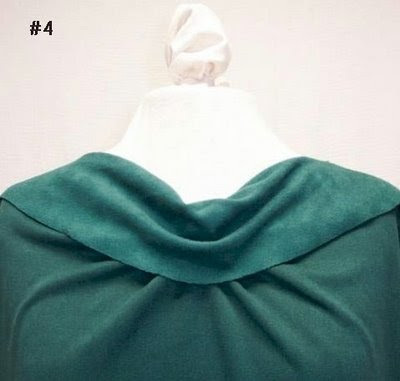 Now turn down the facing to cover the banded fabric, as shown in photo #4. As shown in photo #5, when the garment is turned right-side-out, the twisted detail becomes a new interesting design feature of the top! Where you pinch and band the fabric is totally up to you: higher, lower, to the left or right of center, etc. There are infinite possibilities for design variations like these.... Have fun! Very cool idea, Pam! One of my favorite cowl patterns is Vogue 9771. That will make a very chic "twist" to it! You have such great ideas! Thanks for sharing! Thanks for this genius twist idea. 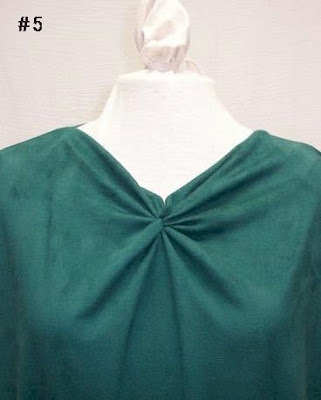 I have a cowl neck blouse made from Hot Patterns 104....I don't wear it much because the cowl drapes entirely too low, exposing more than I am comfortable with. I will definitely give your tip a try on this one.....hopefully it will turn my unwearable top into one that I will enjoy wearing. a rubber band, who knew! Thanks for commenting on my blog, it's a pleasure to meet you so to say. I LOVE, LOVE the tip you gave for changing the front drape of a cowl neck top. I've been making lots of tops and am always looking for new design details. This one is easy and I will be using it very soon. I looked at this tutorial some days ago and was thinking about it this morning and forgot which blog I saw it on. I have spent ALL MORNING LONG looking through different blogs trying to find it and FINALLY I tried yours. You'd better bet I'll write the location down this time! (lol).